Pulse Orlando shooting and conservative Christian anti-gay rhetoric. 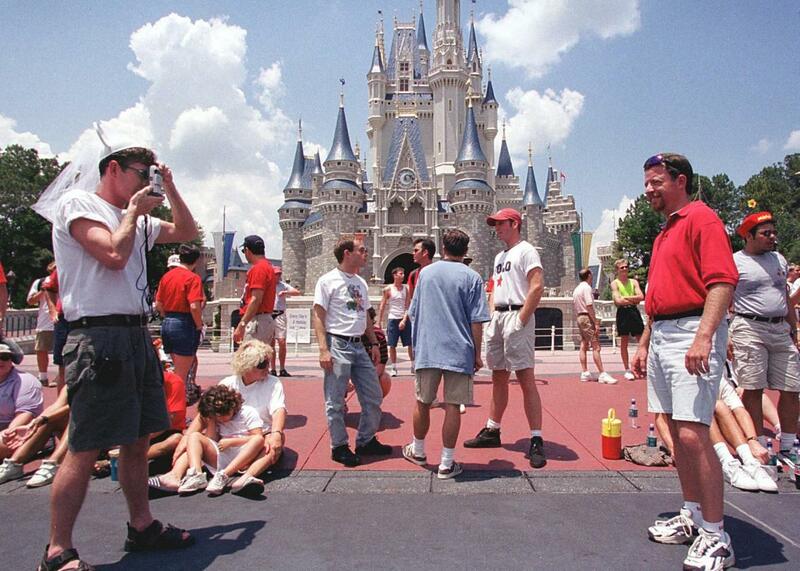 Two gay men take photos at the base of the Walt Disney World Castle during Gay Days on June 5, 1999. Christians who have resisted the redefinition of marriage, and who now want to be free to live what their faith teaches them is the truth about marriage, do not hate anyone, and legislation to protect their freedom is not “anti-LGBT” except in the minds of the intolerant enforcers of coerced conformity. Let us examine the recent historical record to ascertain the veracity of this claim. We will focus on Orlando, the scene of Sunday’s crime, and use as our anchor that city’s most famous and beloved icon: Walt Disney World. Starting in 1991, Disney World drew annual anti-gay opprobrium as the theme park began to allow “Gay Days,” where gay people and their families set a date to enjoy the Magic Kingdom together. The first Gay Day lasted a single day and drew 3,000; it now lasts nearly a week and draws 150,000. Although not officially sanctioned by Disney, Gay Days earned the company the ire of conservative Christian groups, who denounced the event as a depraved celebration of sickness. The convention’s boycott lasted eight years, and drew support from similar groups, including the American Family Association, the Catholic League, Catholics United for the Faith Inc., Citizens for a Better America, Concerned Women for America, and Free Will Baptists. Naturally, Focus on the Family—maybe the single most influential anti-gay group from the ’90s through the mid-aughts—jumped in as well. “Focus on the Family now vigorously supports a boycott against anything that bears the Disney name and recommends that families,” Dobson continued, “especially those of the Christian faith, no longer trust or patronize their products and programming.” Dobson and his allies compiled a list of Disney movies to boycott, including 101 Dalmatians, Air Bud, and Bambi. Incidentally, the American Family Association promoted ex-gay conversion therapy in the same newsletter that announced the boycott. And so on. Perhaps this rhetoric helps to explain why the Pulse gunman apparently considered Gay Days as an alternate target for mass slaughter. It is critically important to note two things about the ongoing protests against Gay Days and Disney. First, the organizations behind the boycott—which today sound like batty loons on the fringe of conservatism—were completely mainstream in their day. There was, at the time, simply less societal pressure, as there is today, to dress up their anti-gay animus in neutral-sounding pabulum about “traditional marriage.” Second, many parents took these protests and boycotts seriously. Growing up in Florida, I knew of families that avoided Disney movies and theme parks specifically because of Gay Days. These parents’ actions sent a clear message to their children, some of whom turned out to be LGBTQ: Queer identity is so vile, so morally repulsive, that even supporting a gay-tolerant corporation is sinful. Until very recently, the Christian right’s primary mode of attack on the LGBTQ community did not center around pleas for “traditional marriage.” It centered around cruel, ferocious attacks on our families and our identities, depicting us as debauched perverts and disgusting lechers. And once a year, the entire weight of this animus came crashing down on Orlando—just because a bunch of gay families wanted to take their kids to Disney World at the same time. Conservative Christian activists may not be directly to blame for the massacre at Pulse. But they are responsible for relentlessly vilifying the LGBTQ community in terms that often spilled over into outright hatred. *Update, June 15, 2016: This post has been updated to clarify that the company ABC Family has renamed its TV station Freeform.